9. Feather pecking and cannibalism: can we really stop beak trimming? 11. Stocking density: Can we judge how much space poultry need? Advances in Poultry Welfare provides a targeted overview of contemporary developments in poultry welfare. The reviews in the volume address topical issues related to poultry welfare research and assessment, with a focus on identifying practical strategies for improvement as well as information gaps that remain to be filled. Part One provides an introduction to poultry production systems and gives a broad overview of current poultry welfare issues. Part Two moves on to review several aspects of poultry management, focusing on hatchery practices, early rearing, and slaughter. Part Three deals with welfare assessment on the farm, while Part Four explores continuing challenges, such as feather pecking and skeletal problems. This is followed in Part Five by a discussion of emerging issues, with chapters covering alternative parasite control methods, backyard poultry production, mass depopulation, and genetic approaches to reducing the impact of environmental stressors on welfare. This book is an essential part of the wider ranging series Advances in Farm Animal Welfare, with coverage of cattle, sheep, pigs, and poultry. 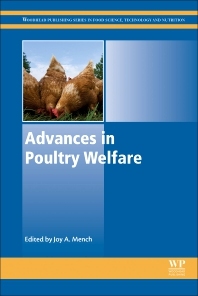 With its expert editor and international team of contributors, Advances in Poultry Welfare is a key reference tool for welfare research scientists and students, veterinarians involved in welfare assessment, and indeed anyone with a professional interest in the welfare of poultry. Joy Mench is Professor Emeritus in the Department of Animal Science at the University of California, Davis, USA, and acts as an animal welfare consultant to various food system stakeholders, including animal producers, retailers, and non-governmental organizations. Her expertise spans both avian and animal sciences, with a particular focus on ethics and animal behavior and welfare.